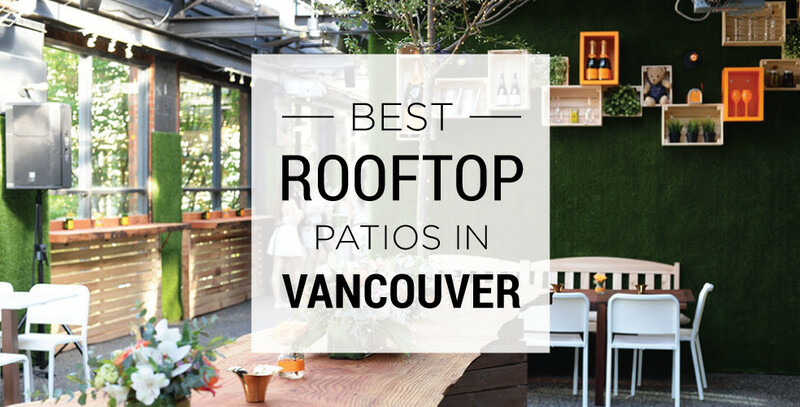 Vancouver doesn’t have a huge number of rooftop patios, but the ones we do have are certainly something to “cheers” to. 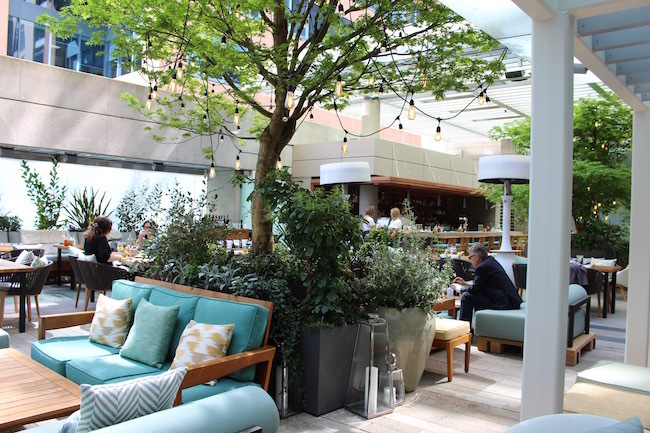 From casual and breezy open air venues to swanky downtown bars, here is our guide to the best rooftop patios in the city. 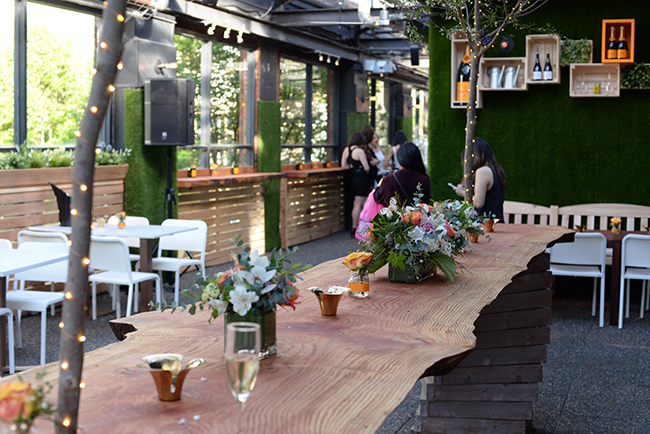 Lined by a beautiful blooming garden and a living green wall, Joe Fortes’ rooftop patio provides a great escape from the hustle and bustle of Robson Street below. Sun-drenched, the iconic space is a wonderfully peaceful spot to indulge on the restaurant’s signature seafood-focused dishes. A new outdoor pop-up patio restaurant has recently opened Downtown. Hidden above the city, Roof Garten (located at the junction of Smithe and Granville Streets) offers patrons a unique dining and cocktail experience. Exclusively running for one summer only, the elevated space features beautiful lush green and wooden details, lounge seating, a scattering of tables and chairs, and a long wooden table centre piece. 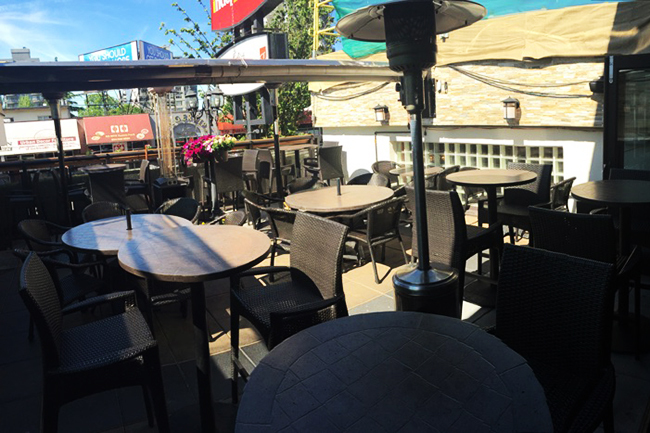 Darby’s Kitsilano patio is a non-pretentious bar patio with an impressive line-up of B.C. craft beers and decent food specials. It doesn’t hurt that the patio is sun-drenched most of the day and you won’t be frowned upon for showing up in sandals and beach wear. 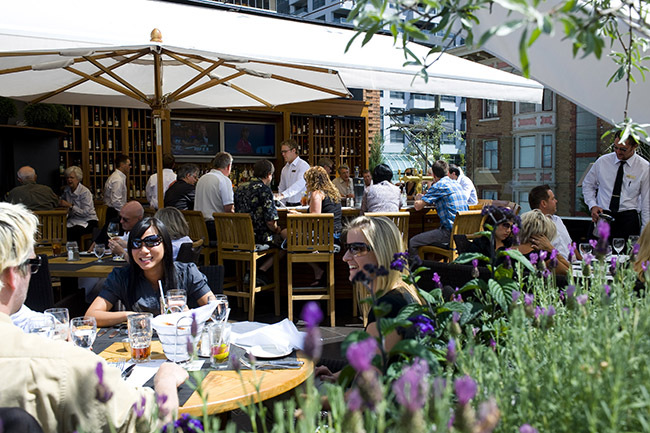 The Keg’s Yaletown rooftop patio is one of the most sought after open air spaces in the city. Overlooking the warehouses on Mainland Street, coupled with a solid drinks and food menu, The Keg’s comfortably furnished patio has undeniable appeal. 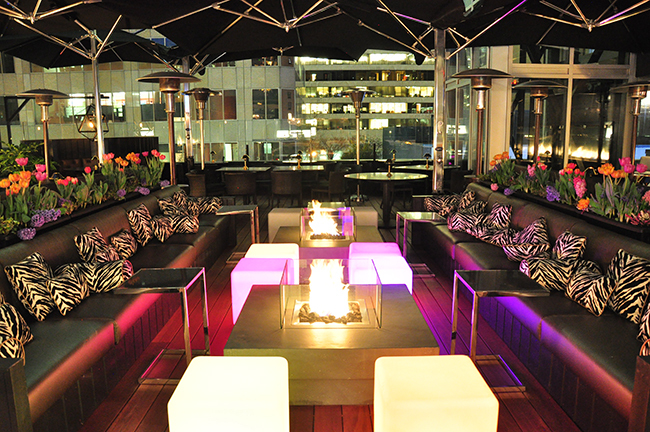 Situated on the top of Black+Blue on Alberni Street, The Roof’s patio has been designed with a sophisticated late night crowd in mind. Indeed, the space has been decorated with ultra modern furnishings and open pit table fireplaces. 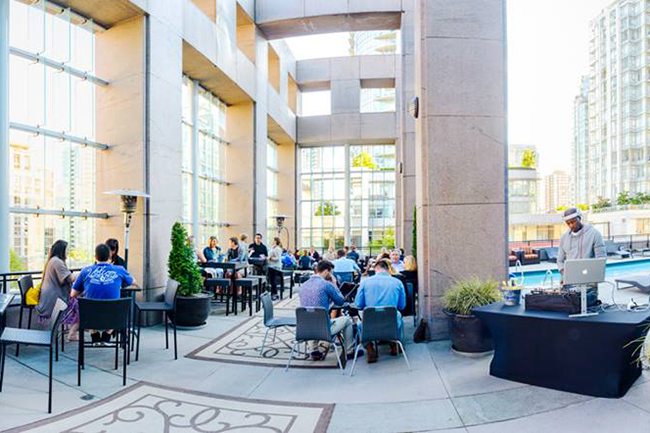 Guests who are lucky enough to grab a seat on one of Vancouver’s largest rooftop patios, can enjoy a range of summery libations from the bar and appetizing plates from the kitchen’s menu selections. 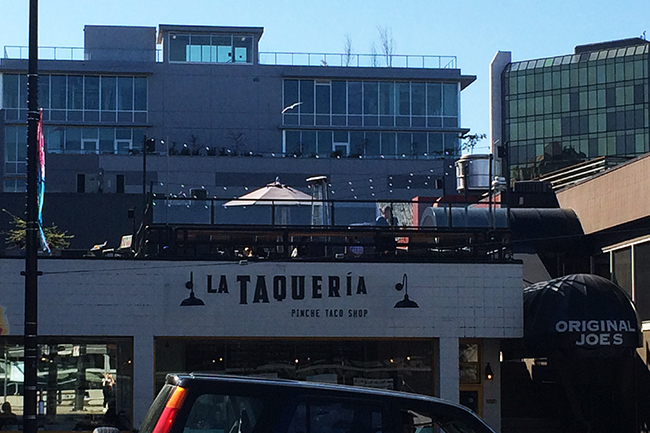 You’d be forgiven for thinking that Original Joe’s 40-seat patio belongs to La Taqueria on Cambie Street, as the outdoor space sits on top of the popular taco shop. Connected through a side entrance, the patio at Original Joe’s is super chilled and receives a ton of sunlight, which makes it a fantastic spot to enjoy a relaxed drink and meal during the day. Slated to open in June, the rooftop deck at the new Vij’s on Cambie going to be a real game changer, not just for the restaurant itself, but for the neighbourhood. Head up to the top of this quirky Cambie Street restaurant and sip drinks and snacks surrounded by a sky-high “fence” of lights; this is in part what gave the new flagship its nickname, Vij’s Lantern. Make the patio your destination, or hang out there waiting for your table in the main dining room. Reflections at the Rosewood Hotel Georgia has a beautifully laid-out patio, where specialty cocktails and light edible fare can be enjoyed. While some may question Reflections legitimacy as a rooftop patio (it’s located on the hotel’s 4th story landing not the roof per se), it does lay claim to this title as there are no structures above it. Reminiscent of outdoor spaces found in L.A., New York, and Miami, Reflections: The Garden Terrace, surrounded by soaring buildings, is the ideal urban oasis. 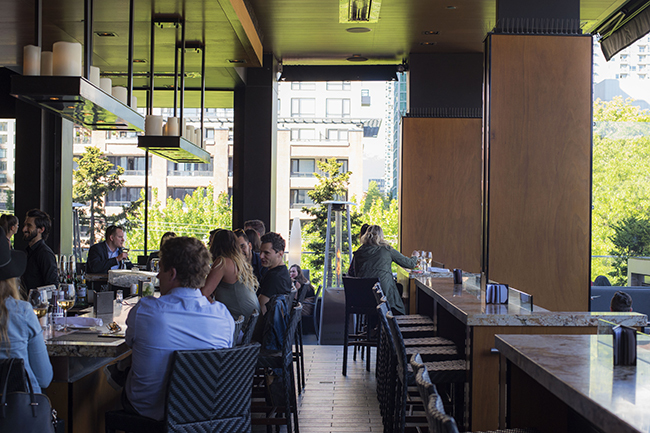 You’ve probably walked by Homer and Robson more than a few times, but missed the patio perched a couple of floors above street level at the Westin Grand Hotel. 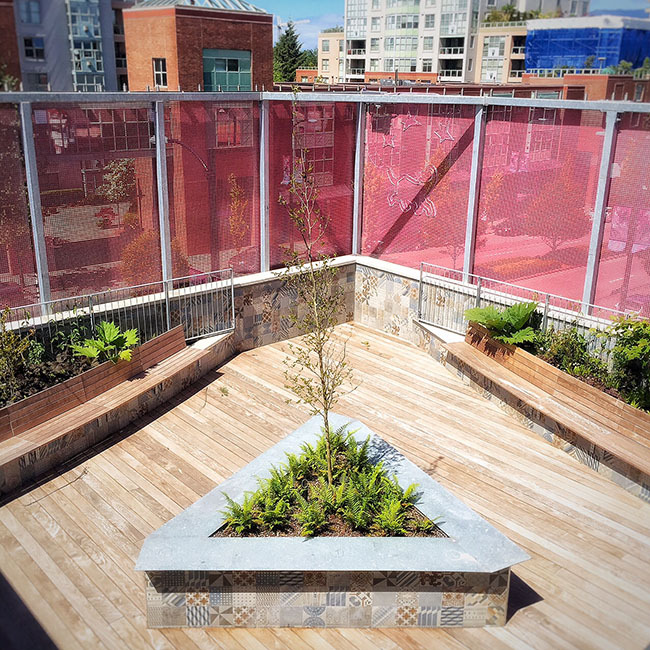 It’s all based on good weather and good timing, which is why it’s called Pop-up Patio. During the summer months, on Thursdays and Fridays only, it becomes a patio party with a pool side terrace, live DJ, BBQ bites, and crafted cocktails and beers. As always the pop-up patio is weather dependent. 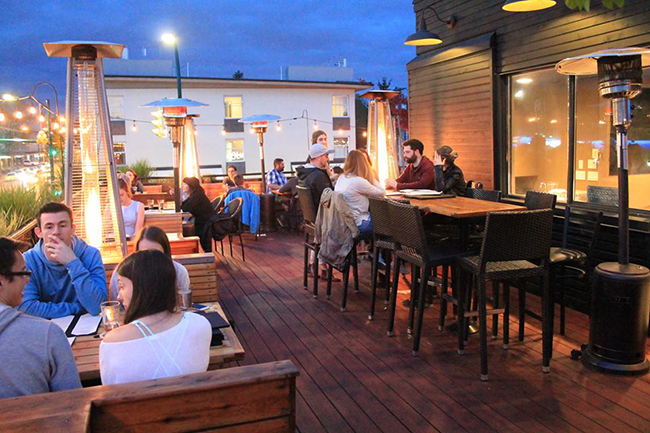 Davie Street’s Upper Deck restaurant is known for its Neapolitan-style pizza and sunny patio. While the patio is not technically situated on the restaurant’s rooftop, it is roofless and perched on top of the structure below. On a sunny day, kick back in relaxed fashion and enjoy a wide variety of local craft beer, as well as the kitchen’s comforting fare.